Advantages: Interesting and otherwise neglected story of the early years of the German heavy fighter units and their aircraft; concise and interesting narrative; large, relevant photos; great profiles - terrific inspiration for modellers. I was delighted to see that one of the new series to branch out of the Luftwaffe Colours project describes the colours and markings of Zerstörer (literally "Destroyer", but more accurately described as heavy fighter) units. This is a fascinating yet largely neglected corner of Luftwaffe history. Considered at its inception to be the elite arm of the Luftwaffe, the reputation of the Zerstörer units was left in tatters after the Battle of Britain. Even so, these heavy fighters continued to deliver useful, if sometimes ill-targetted, service to the Luftwaffe in the years to come. 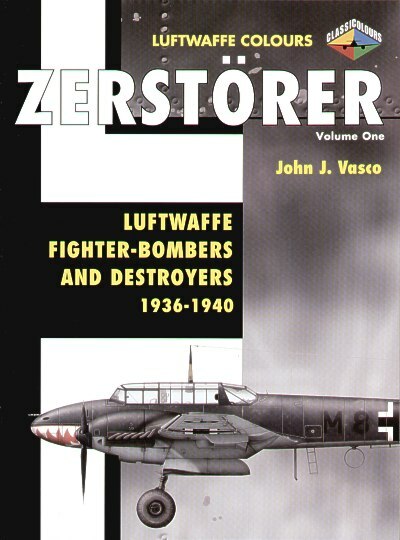 Zerstörer Volume One chronicles the subject from the conception and development of the heavy fighter, through service in Poland, the Phoney War, the famous confrontations in the Heligoland Bight, Scandinavia, France and the Low Countries and, of course, the Battle of Britain. Indeed, author John Vasco delivers the most detail on this great turning point in the fortunes of German air power, and the role of the Zerstörer Gruppen therein. More than half of the book contains a month-by-month, and sometimes day-by-day, account of the air war over Britain from July to October 1940 and to the end of 1940. Due to the time period involved, the sole aircraft type covered is the Messerschmitt Bf 110. Although the Bf 110 may not have worn the same variety of colourful livery as its smaller brother, the Bf 109, this was an interesting period of transition and tactical markings for the Zerstörer aircraft too. The book comprises 96 pages in the familiar large format (303mm x 206mm) of the series. The text deals almost exclusively with operations. Around 200 photos, mostly of the aircraft of the period, are one of the highlights of this title. Captions are detailed and relevant, and provide useful information about the colours and markings of the subjects. The side profile illustrations are very attractive, although the gray tone and lack of contrast in the RLM 70/71 subjects are not to my personal liking. However, it is possible that this is a reproduction (printing) problem rather than a choice of the artist. I am delighted to see Classic turn their attention to Zerstörer, and I look forward to reading the continuing story of the Messerschmitt Bf 110 and the introduction of the Ju 88 in future volumes.